Brandon Rumbaugh joined the Marines at the age of 18 in November 2007 as an 81mm mortar gunner with the 1st Battalion, 8th Marines. In March 2009, he deployed for the first time to Iraq for seven months in March 2009. Shortly after returning home, he deployed to Afghanistan, where he served as squad leader. On Nov. 29, 2010, Corporal Rumbaugh had just returned to an outpost from a combat patrol with the 1st Battalion, 8th Marines, and was responding to the scene of an improvised explosive device (IED) blast involving one of his good friends outside the compound in Helmand Province, Afghanistan. 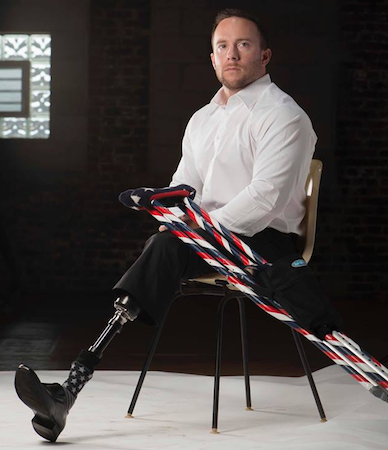 Carrying a stretcher, and rushing with his team to aid the injured Marine, Brandon stepped on a second IED resulting in the traumatic amputations of his right leg at the hip and his left leg below the knee. Medically evacuated by helicopter, Cpl Rumbaugh was treated at Camp Bastion before being airlifted to Landstuhl, Germany. Next, he was transferred to Walter Reed Army Medical Center in Washington, D.C. in Bethesda, Maryland, spending a total of 18 months receiving treatments and therapies. Since moving into his specially adapted custom home in April 2014, Brandon has started a family with his fiancee Cassy Sanderson. The couple became proud parents to a baby girl, Remi Delaine, in March 2019. Brandon has become an advocate for his fellow Veterans and community. He has been supporting Veterans going through difficult times by working for a nonprofit called, It’s About the Warrior Foundation (IATW). The organization helps assist and empower post 9/11 Veterans in his area with financial, educational, recreational, and therapeutic needs. As a board member, Brandon oversees the grant and application process and all new member registrations. He is also in the process of opening his own nonprofit to support fellow Veterans in his community. He has become motivational speaker, often sharing his personal story with audiences ranging from corporate executives to college hockey teams and elementary school students. In November 2015, Brandon spent the month living outside to raise awareness and funds for homeless Veterans. Brandon is currently pursuing a college education to obtain his business degree at Penn State. He enjoys weightlifting, baseball, basketball, and shooting. He would like to compete the weightlifting division in the Paralympic Games in the future. Brandon says he feels fortunate to be in a position to give back by helping others. “HFOT has secured my future, not only with a beautiful fully accessible house but with a forever network of volunteers I know I can count on in any aspect of my life,” he says. The Meadville Tribune, Feb. 10, 2019 More than 100 students gathered at the Crawford County Career and Technical Center on Thursday to celebrate SkillsUSA Week, recognizing the work of the nonprofit association and its partnership between, students, instructors and industry working together to build a pipeline to trades and skilled work. The event included a speech from U.S. Marine Cpl Brandon Rumbaugh about the lessons he learned fighting in the Middle East, persevering after losing both his legs in an explosion, and being granted a house from Homes For Our Troops.